The Twister™ jar is designed to blend your thickest blends! The Twister™ jar is designed to blend your thickest recipes, such as nut butters, hummus, baby food, dips, thick shakes, dressings and more! The Patented Twister lid, a Mini Gripper™ lid for containing thinner blends and the awesome spectacula™ spatula! The Blendtec Twister™ jar blends very thick recipes, such as nut butters, hummus, baby food, dips, thick shakes, dressings and more! Blendtec's ultra-hard stainless steel blades are cold-forged and tuned for heavy use. This allows them to be stronger and resist corrosion much better than lesser blades. 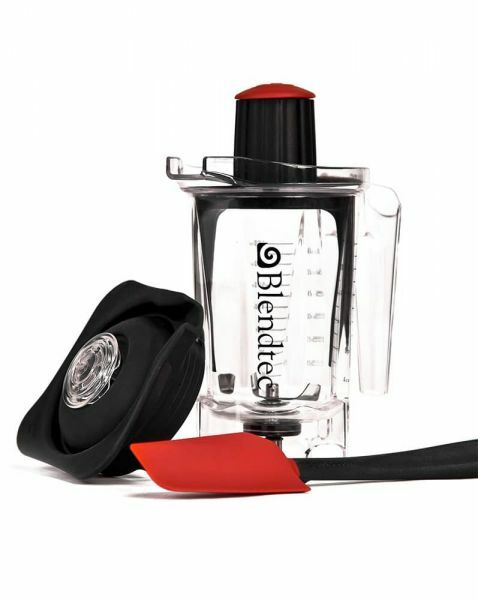 A great invention by Blendtec! If you think it's too thick what you want to blend, it's probably not. Not for the Blendtec Twister jar. The secret is the patent-pending Twister lid featuring tines that run along the inner side of the jar. As the blade forces ingredients onto the side of the jar, you simply twist the lid to scrape the ingredients back into the lid blending vortex. The result is fast blending of thick ingredients, without stopping to scrape the sides manually. It also comes with a Gripper lid to contain thinner, single-serve blends. It blends the creamiest hummus, make your own little batches of bread dough or cookie dough! It works best for dessert such as ice cream, sorbet or the crust of your cake! Also included is a spatula—engineered specifically for the Twister. We made this spatula just the right length and shape so you can get nearly every morsel out of your jar. You will get a Mini Twister Cookbook with many recipes, ideas and tips to get started! Related links to "Twister Jar"
Customer evaluation for "Twister Jar"